Nima Arkani-Hamed (born 1972) is a leading theoretical physicist with interests in high-energy physics, string theory and cosmology. * Witten was mentioned in the comic Ex Machina. 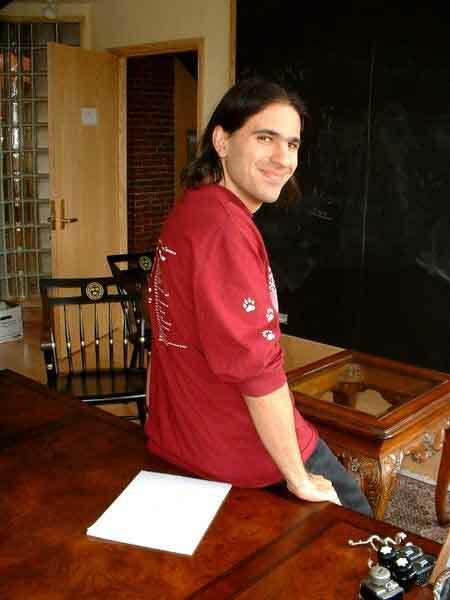 Nima Arkani-Hamed was born in 1972 in the U.S. to Iranian parents (also physicists) and became a Canadian citizen. Arkani-Hamed graduated from the University of Toronto with a Joint Honours degree in Mathematics and Physics, and went to the University of California, Berkeley for his graduate studies, where he worked under the supervision of Lawrence Hall. He completed his Ph.D in 1997 and went to SLAC for post-doctoral studies. During this time he worked with Savas Dimopoulos and this is when the idea of large extra dimensions emerged. In 1999 he joined the faculty of the University of California, Berkeley physics department. He took a leave of absence from Berkeley to visit Harvard University in the spring 2001. Shortly after arriving at Harvard he worked with Howard Georgi and Andrew Cohen on idea of emergent extra dimensions, dubbed deconstruction. These ideas eventually led to the development of little Higgs theories. He officially joined Harvard's faculty in the fall of 2002. Arkani-Hamed has appeared on various television programmes and newspapers talking about space, time and dimensions and the current state of theoretical physics. In the summer of 2005 while at Harvard he won the 'Phi Beta Kappa' award for teaching excellence. Nima Arkani-Hamed participated in the Stock Exchange of Visions project in 2007. He was a Professor of Physics at Harvard University from 2002-2008, and is now on the Faculty at the Institute for Advanced Study. 2. ^ N. Arkani-Hamed, S. Dimopoulos, G. Dvali (1998). "The Hierarchy problem and new dimensions at a millimeter". Phys. Lett. B 436: 263-272. 3. ^ I Antoniadis, N. Arkani-Hamed, S. Dimopoulos, G. Dvali (1998). "New dimensions at a millimeter to a Fermi and superstrings at a TeV". Phys. Lett. B 429: 257-263. 4. ^ N. Arkani-Hamed, S. Dimopoulos, G. Dvali (1999). "Phenomenology, astrophysics and cosmology of theories with submillimeter dimensions and TeV scale quantum gravity". Phys. Rev. D 59: 086004. 5. ^ N. Arkani-Hamed, A. G. Cohen, H. Georgi (2001). "(De)constructing dimensions". Phys. Rev. Lett. 86: 4757-4761. 6. ^ N. Arkani-Hamed, A. G. Cohen, H. Georgi (2001). "Electroweak symmetry breaking from dimensional deconstruction". Phys. Lett. B. 513: 232-240. 7. ^ N. Arkani-Hamed, A. G. Cohen, T. Gregoire, J. G. Wacker (2002). "Phenomenology of electroweak symmetry breaking from theory space". JHEP 0208: 020. 8. ^ N. Arkani-Hamed, A. G. Cohen, T. Gregoire,E. Katz, A. E. Nelson, J. G. Wacker (2002). "The Minimal moose for a little Higgs". JHEP 0208: 021. 9. ^ N. Arkani-Hamed, A. G. Cohen, E. Katz, A. E. Nelson (2002). "The Littlest Higgs". JHEP 0207: 034. 10. ^ N. Arkani-Hamed, H.C. Cheng, M. A. Luty, S. Mukohyama (2004). "Ghost condensation and a consistent infrared modification of gravity". JHEP 0405: 074. 11. ^ N. Arkani-Hamed,S. Dimopoulos (2005). "Supersymmetric unification without low energy supersymmetry and signatures for fine-tuning at the LHC". JHEP 0506: 073. 12. ^ N. Arkani-Hamed,S. Dimopoulos, G. F. Giudice, A. Romanino (2005). "Aspects of split supersymmetry". Nucl. Phys. B 0709: 3-46.